Last weekend, while waiting on the late-again countertop installers, I crossed off a huge but simple to-do that was long overdue…craft supply organization. 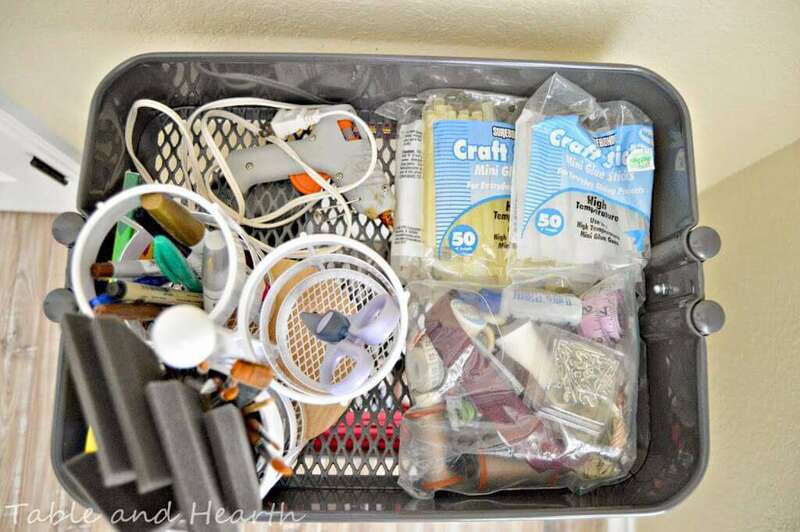 Why does it seem like craft supplies multiply at the same rate they disappear? Things I swear I had are completely MIA (stamps) and things I didn’t even know I had anymore are there en masse (sponge brushes!). Aside from being positive there are gnomes in the house that jack with me, my current storage system obviously wasn’t helping the issue. We got the Ikea Hemnes daybed years ago and were stoked about the three huge storage drawers, however, one of them has looked like this from the day we put it together. And it has spilled over to the two storage boxes under our coffee table. 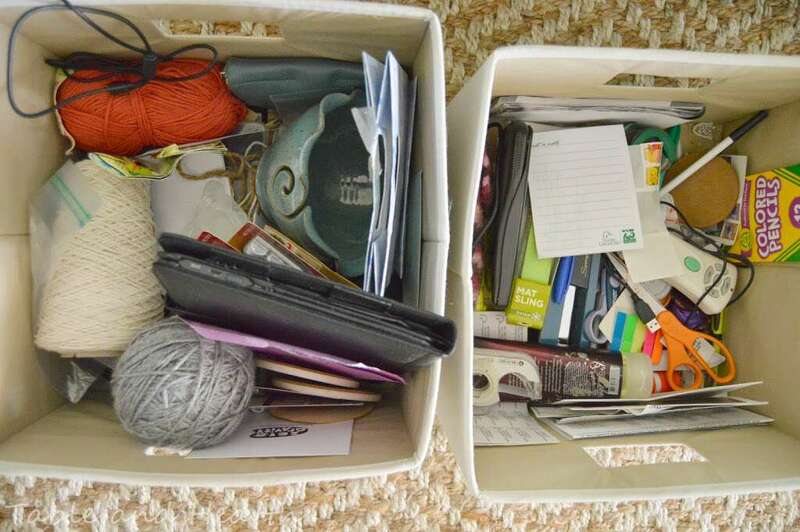 The left one was meant to be my “current” crocheting supplies but I haven’t made anything since about November, and the right one is our catch-all/junk drawer of basic supplies which all my markers, Sharpies, pencils have accumulated. 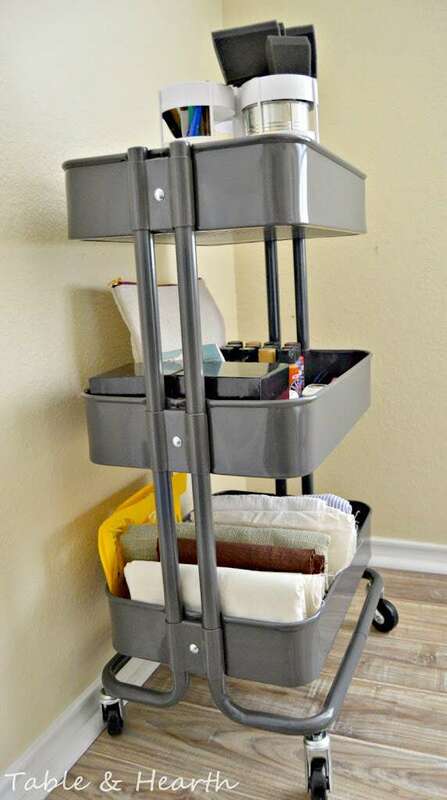 Anyway, one Sherry’s organization pieces included the Raskog cart from IKEA. It would be perfect for us! I don’t have a whole vacant closet to organize so whatever I use needs to squeeze in with the other crap in our guest room closet. Done and done. We finally squeezed in a trip last month and it was the first thing on my list. First thing I did (after assembling the Raskog of course) was peruse Tarjay for some cute on-Raskog organizer options. 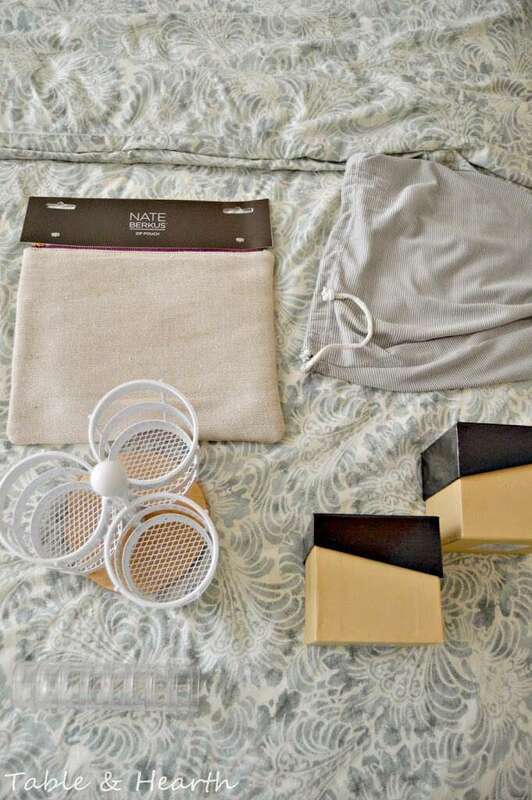 I came up with a Nate Berkus zipper pouch, a lazy susan utensil caddy, a couple of black and Kraft boxes, and the bag from a new set of striped sheets I picked up there too. It doesn’t seem like alot but I wasn’t sure how much I’d need exactly so I kept it simple. Turns out it was just right. 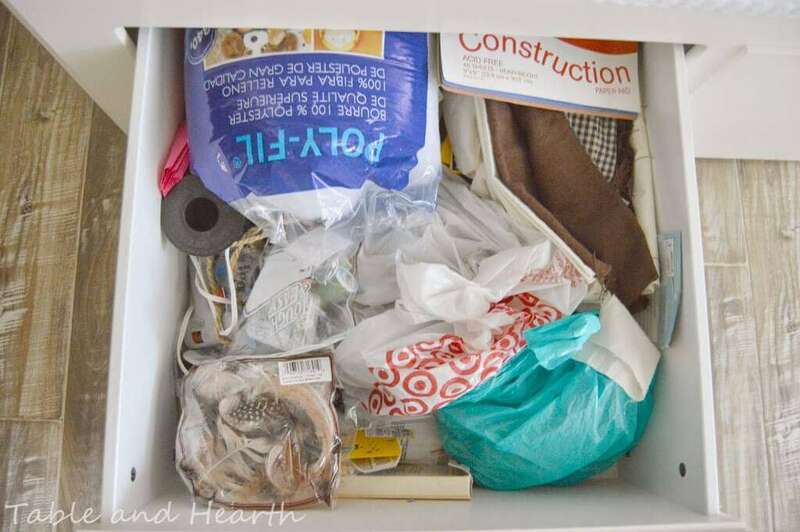 Next I gathered all of my junk from said drawers and separated it out into relative types/tasks. The boxes contain acorns for a Christmas garland project and leftover ribbon from the ribbon backdrop I made for the wedding. I decided to keep the Raskog just to direct craft supplies so these boxes remain and I’ll devise some other method of storing at least the ribbon down the line. 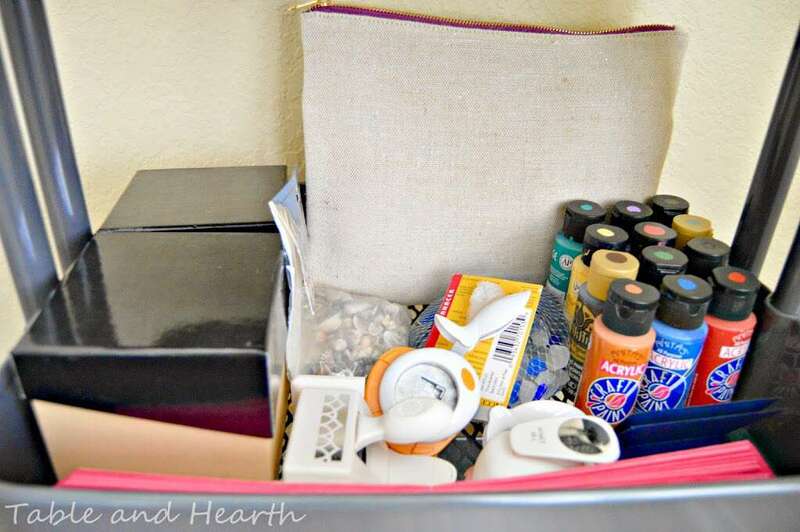 The top shelf contains things I use more regularly, the glue stick, my sewing bag, and the utensil caddy filled with markers, scissors, and the unexplained amount of foam brushes I found. I dropped an empty tin can in the paintbrush cup cause some of their ends were falling through the mesh on the bottom. 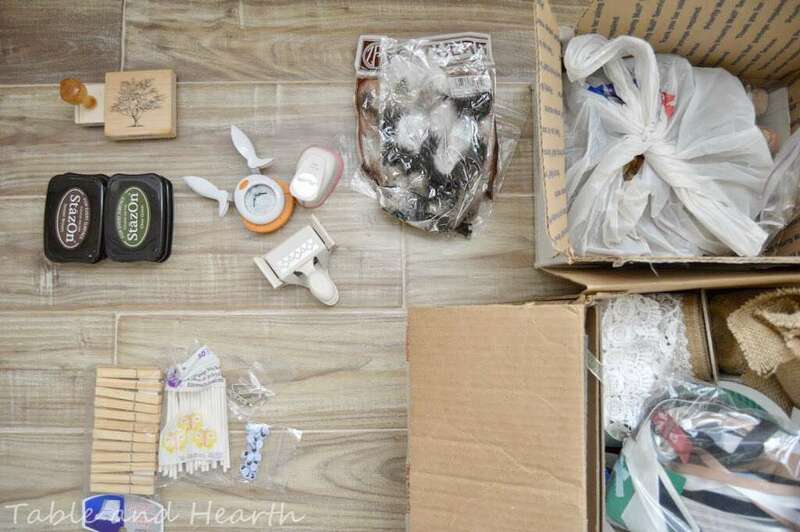 The second shelf has the craft paint, scrapbooking punches, some seaglass and craft seashells, the boxes, extra tissue pom-poms, and the pouch. Glues/adhesives went in one box and ink pads went in the other. 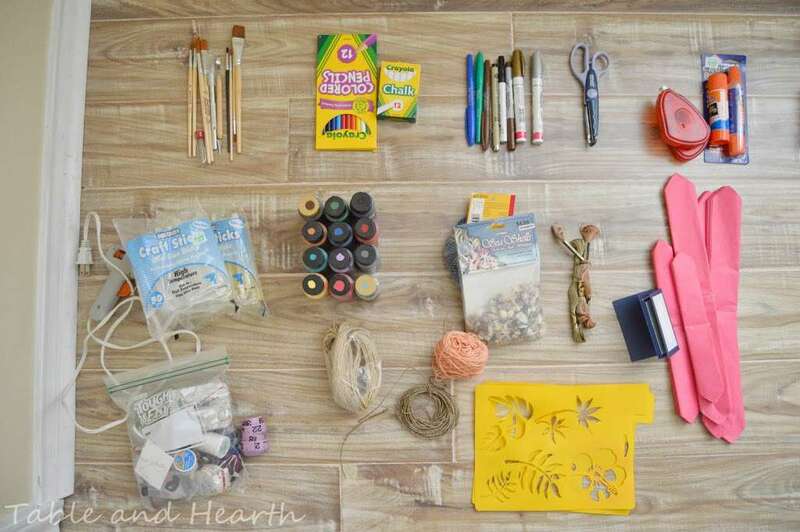 The zippered pouch holds the feathers, googley eyes, clothespins, and other random craft-support/miscellaneous items. 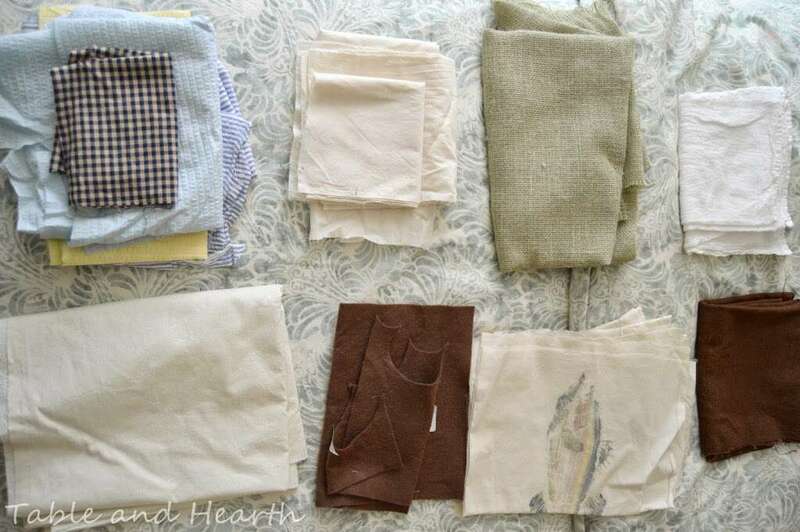 The bottom tray has all of the fabric scraps and stencils. 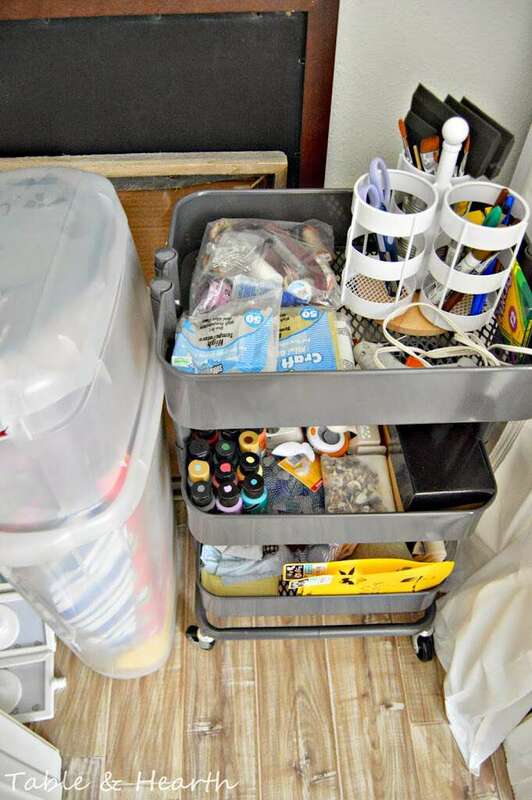 I must have done some craft supply purging sometime before and blocked it out cause when I got it all on the cart I had a ton of extra space. Lots of room for more supplies! I have all of my gift-wrapping supplies in an upright plastic holder and the Raskog slips in right between it and my wedding gown (that I still need to send off to be preserved…). That gift supply box majorly needs to be overhauled too but that can wait, it’s all contained so it works for now. 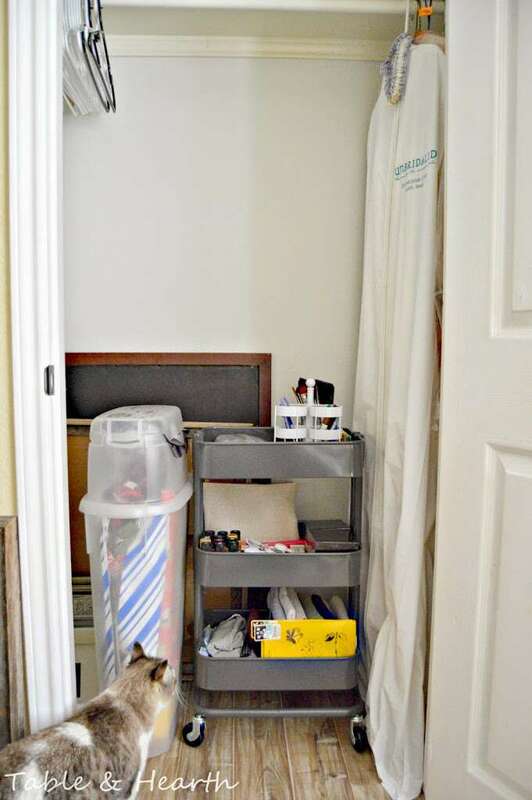 As you can see, there is room above both of them for a hanging closet organizer so when I organize the gift supplies and/or I run out of room on the Raskog, I’ll use that space. I may not have had a ton of stuff like I thought in the beginning, or it is just all organized now and not in a bottomless pit of a drawer. Either way, it is amazing how much room I have now with just putting it orderly on the cart. I have a free drawer in the daybed now and a free box under the coffee table (NOT to fill with supplies again!). I have yet to use it real-time crafting but I did roll it all around the room before these pics to practice it’s on-site supply-ability and it passes with flying colors. 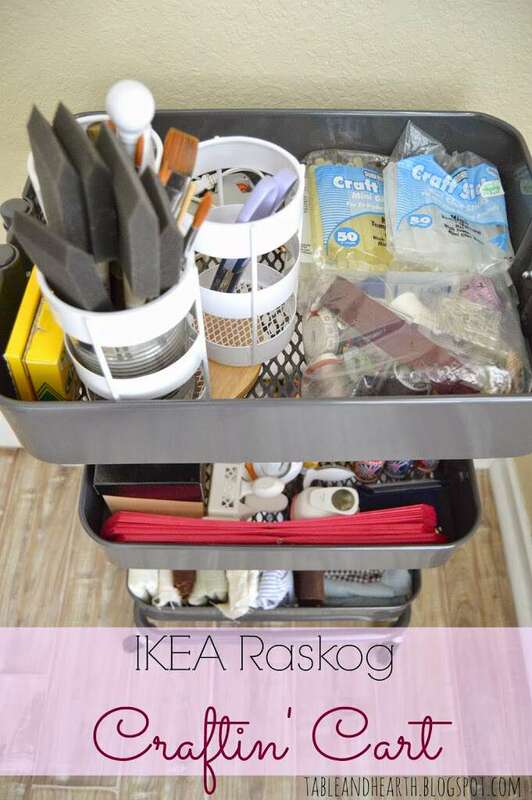 There are a ton of pins on Pinterest from other bloggers that have organized the crap out of the Raskog, especially for scrapbooking supplies, and it is really impressive how much this thing can store, wayyyy more than on mine right now. It comes in other fun colors too like light blue which my friend Rosalie is planning to use for kitchen spices in her little vintage cottage kitchen, will definitely post pics of that! What other ways have y’all used the Raskog? 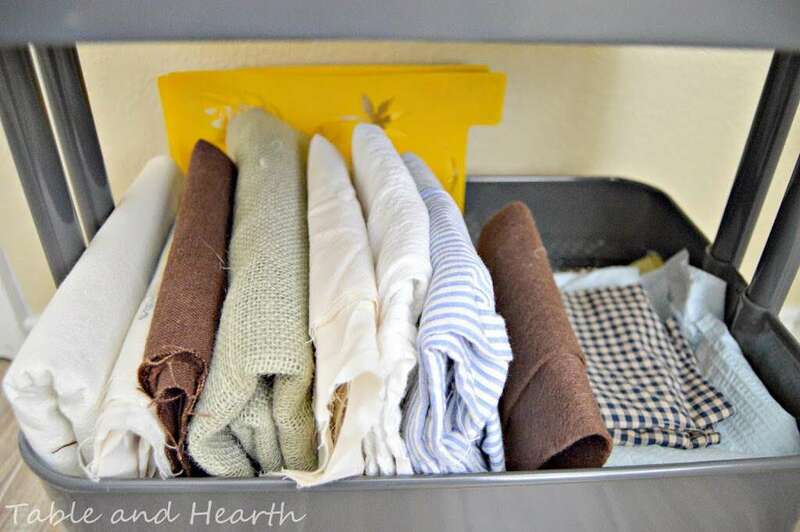 Any sneaky craft storage tips? Thanks Laura! This little dude is so versatile too, I could cram all kinds of stuff on it. I would love to see how you organize yours! Thanks for linking up at Motivational Monday! Love the craft cart! !